A new report has given Virginia and 21 other states a failing grade for their efforts in keeping lead out of the water used to drink and cook at schools. Maryland and D.C. received better grades than previous years. Lead in drinking water isn’t only a problem in Flint, Michigan. This week, a new report has given Virginia and 21 other states a failing grade for their efforts in keeping lead out of the water used to drink and cook at schools. The Environment America Research and Policy Center and U.S. Public Interest Rights Group report “Get the Lead Out” gave Maryland a C after earning an F in the report two years ago and gave D.C. a B+, an improvement from a B in 2017. Here’s a further look at how they ranked. Virginia was one of nearly two dozen states to get an F in this report. The state recently passed a law requiring schools built before 1986 to test taps and fountains for lead every year, but the report notes that doesn’t apply to schools built after that year and it doesn’t apply to day care centers. Virginia is also faulted for not having any standard for when it comes to how much lead can be found in water before triggering action. In Maryland, it’s a 15 parts per billion (ppb) standard, while in D.C. it’s just 5 ppb. The report said the American Academy of Pediatrics is pushing for laws that “ensure that water fountains in schools do not exceed water lead concentrations of 1 ppb.” It goes on to say that “water exceeding this concentration should immediately be removed from service until permanent remediation” steps are taken. But Virginia has new guidelines that schools have to follow if elevated levels of lead are found in the water. The state has no laws requiring transparency and disclosure of any positive tests, according to the report. Maryland received a grade of F two years ago as reports were coming out detailing how many faucets and fountains found inside schools were contaminated with lead. While it’s still a problem, the report gave Maryland a C this year for taking the steps to address it. This year, more than 500 fountains and sinks in schools around the state tested positive for lead and almost half of them were found in Montgomery County. Earlier this week, the House of Delegates unanimously passed a bill lowering the amount of lead allowed in water by 75 percent, while putting money into a program that would allow schools to replace lead contaminated pipes and infrastructure. Two years ago, the state also passed laws requiring mandatory annual testing of all faucets and fountains public and private schools. That law doesn’t apply to day care centers though. Overall, the report makes argues that more needs to be done. A few decades ago, D.C. schools were plagued by water well above the recommended standards for lead. Even 15 years ago, schools were contaminated with lead to the point it was a major health risk. Now it carries the best grade of any jurisdiction studied in the report. 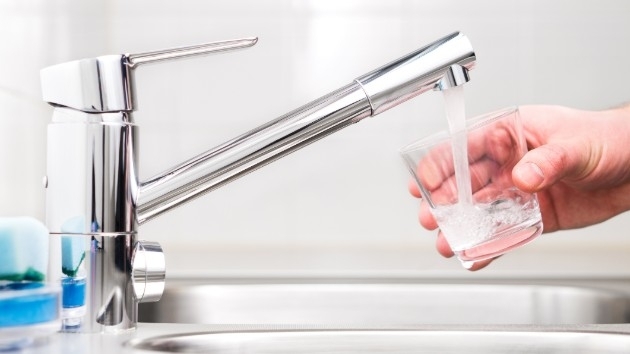 The city is lauded for requiring certified filters at all fountains and faucets used for drinking or cooking, and imposing a stricter standard than the federal government does when it comes to the amount of lead that can be found inside water. In the report, D.C. also gets praise for requiring every faucet and fountain be tested every year, and applying those standards to not just schools, but also early childhood programs, day care centers and even public parks.